Many brides and grooms in Toronto are looking for rustic venues near the city with the feeling of nature and freedom for the day of their weddings and you can see by these Waterstone Estate and Farm wedding photos this fantastic venue hits all of those points. Operated as an equestrian farm and horse training facility the purpose built event venue has the capacity to host up to 150 people for dinner and dancing. It also has a cute little chapel right beside the main building to host the wedding in. There are additional rooms to help with portions of the day such as tea parties and the getting ready of the bride and her girls, with separate rooms for the groom and his groomsmen. It is a great property for wedding photographers as it boasts 100 acres of property which includes open areas, barns, grasses and treed areas so it has everything one could ask for to create wonderful pictures. 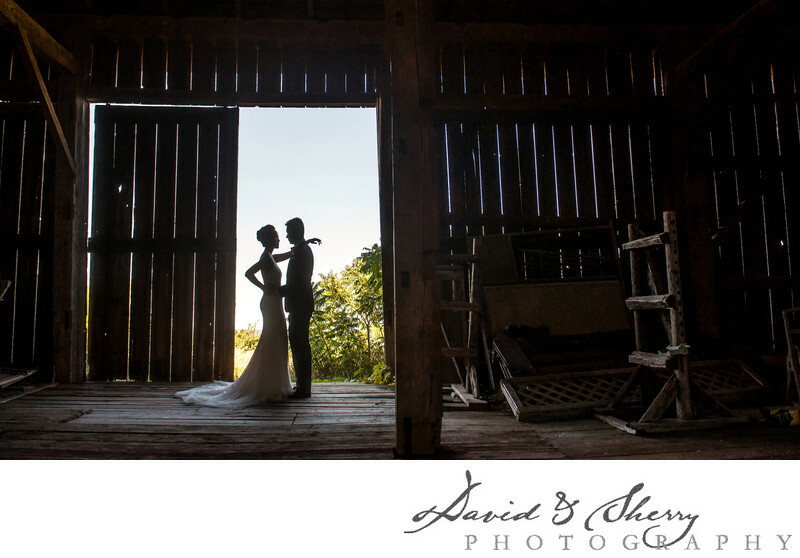 In this photo we have our bride and groom silhouetted against the light coming into the old barn with the rustic barn boards and little slivers of brightness peeking through in between the slats. I love the composition of this picture. Location: 17900 Dufferin St, Newmarket, ON L3Y 4V9.